Every time I am at the grocery story this time of year I cannot refrain from buying a big bag of cherries. We eat them by the handful, like they are candy. They are so amazing. Even the two year old loves them! Did you know fresh cherries are also awesome so tossing in your favorite dessert? 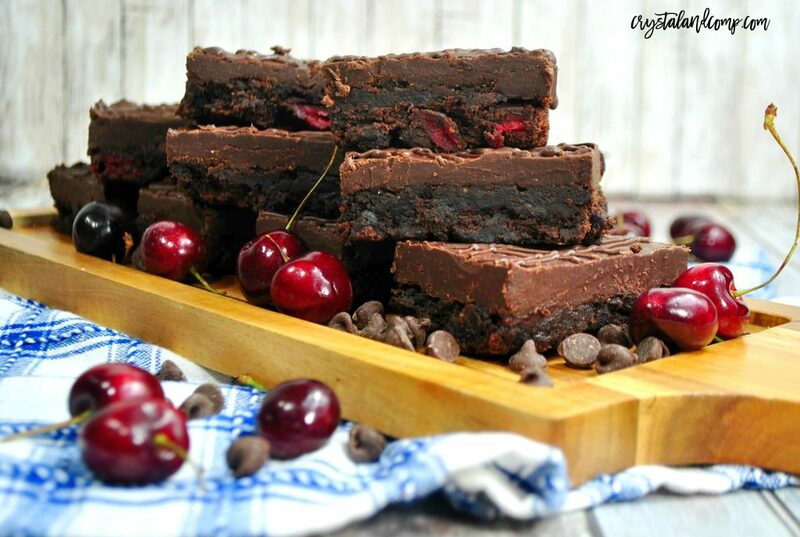 Be creative and change up your favorite homemade brownie recipe! Cherry recipes are perfect for this time of year. 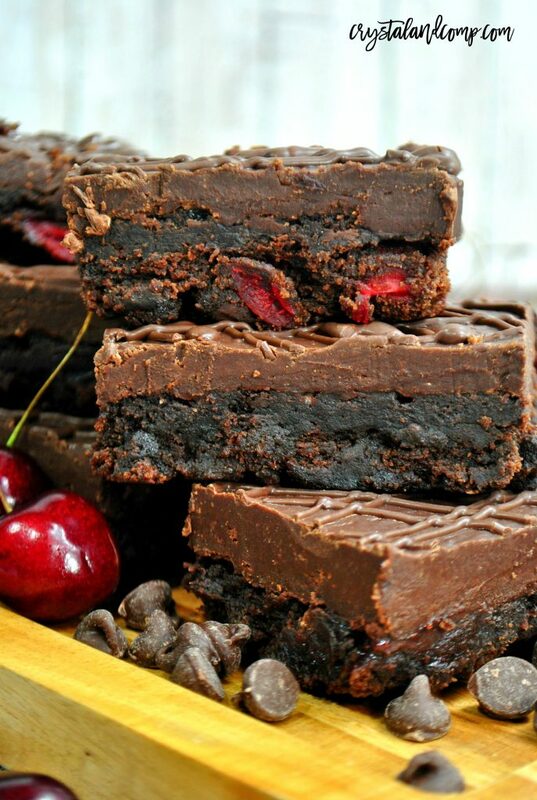 Let me show you how easy it is to make these cherry brownies with chocolate ganache. You are going to love them! First, gather up everything you will need. I like to use parchment paper to make cleanup easy. This is totally up to you. Line a 9×13 pan with parchment paper. Melt butter in the microwave in a small microwave safe bowl. In a large mixing bowl, start to add your ingredients one at a time. I like to start with the sugar, then the eggs, vanilla, cocoa, flour, salt and baking powder. Use a mixer to mix all of this together. Honestly, this is one of those recipes I like to use my Kitchen Aide for. Now, remove the stems from your cherries and use a pitter to get the pits out. 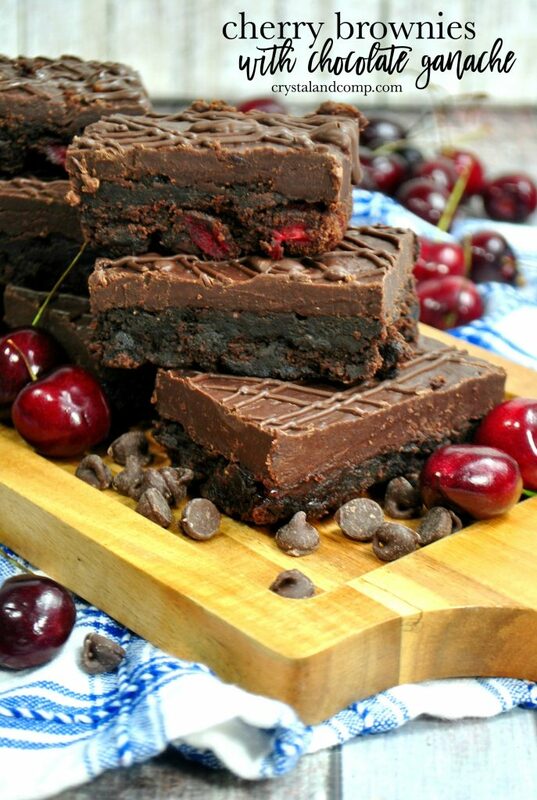 Roughly chop the cherries and add them to the brownie mix. Ensure everything is well combine. Pour brownie mix into your 9×13 baking dish. You can even add a few more cherries on top of the batter if you want. Bake in the oven for 30 minutes or until a knife or toothpick comes out clean. Now, let’s make the ganache for the top! Use a double boiler and add the chocolate chips and heavy whipping cream. Over medium heat warm up the chocolate chips and cream stirring often to combine well as it melts. Keep the other half warm on the stove until what you just poured over the brownies cools. This will likely take about 20 minutes or so. I have been known to pop it in the fridge to speed it up. Once the poured ganache cools, put the other half of the ganache into a large Ziplock bag and cut a tip off the corner of the bag with scissors and drizzle over the brownies. Be as creative as you want. Cut the brownies and enjoy! Pour brownie mix into your 9x13 baking dish. Next, lets make the ganache. Use a double boiler and add the chocolate chips and heavy whipping cream.